Summer is finally here. 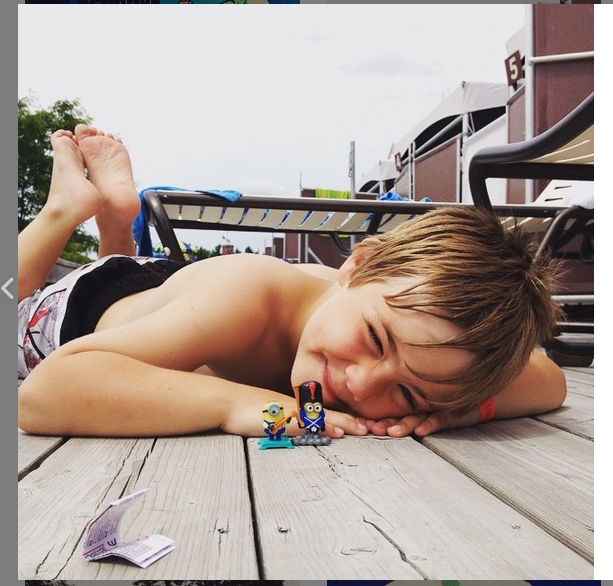 The kids and I have started our summer routine of swimming lessons, swim team, day trips and weekends at the cottage. 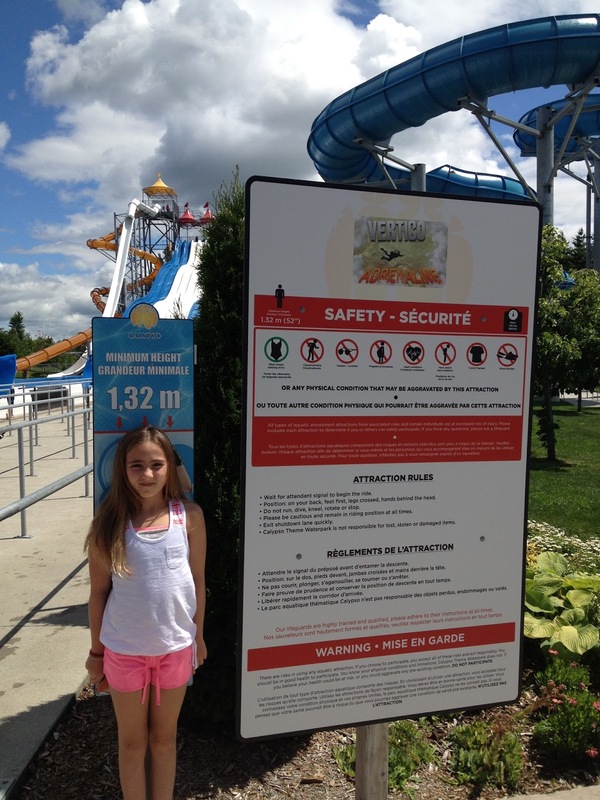 To kick off the summer of 2015, we decided to head over to Calypso water park. 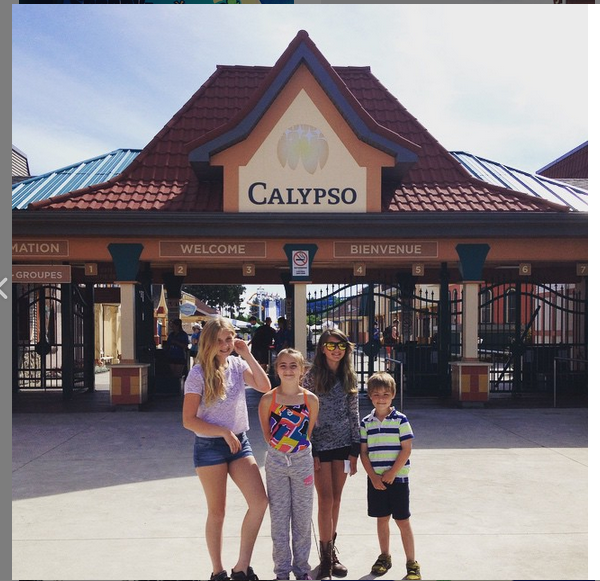 Calypso is North America’s biggest water park and has something for every age group. When you arrive at Calypso the parking fee is $8, are many turnstiles to pay the fee, I suggest bringing cash to make the transaction faster. 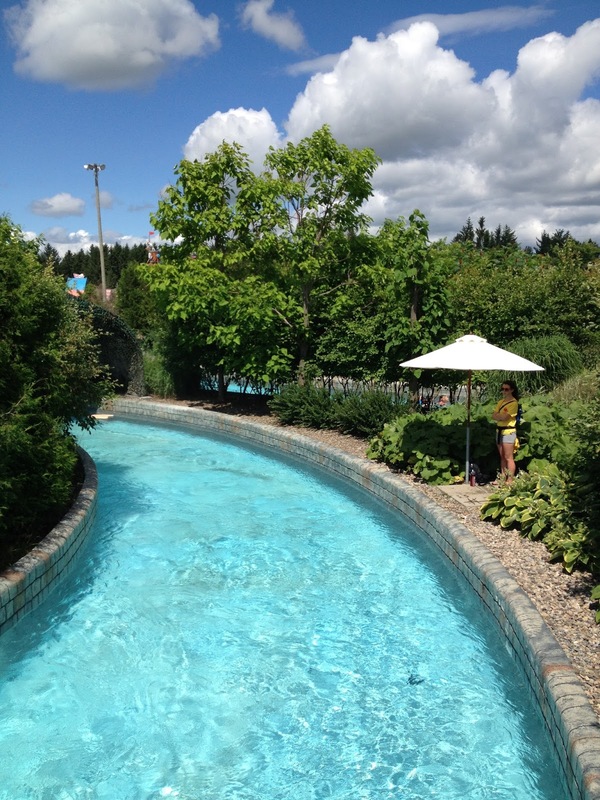 We entered the park with high hopes of water adventure, speedy slides and a welcoming lazy river. Renting a VIP Cabana was first step in the right direction. The Cabana was our home base and meeting place. The Cabana’s come with a fridge, free wifi and most importantly a quiet spot to rest and reconnect with all of our group members. On this trip we had two preteens, a nine year old and a 6 year old. The park actually opens an hour before the slides open. This is a wonderful tidbit of information for families looking to claim a picnic table as a home base for the day. We arrived at 9:30 am and had the opportunity to look around the park area, change into our swimsuits, find the water fountains and look in the gift shops. Our team loaded up for a day of adventure. 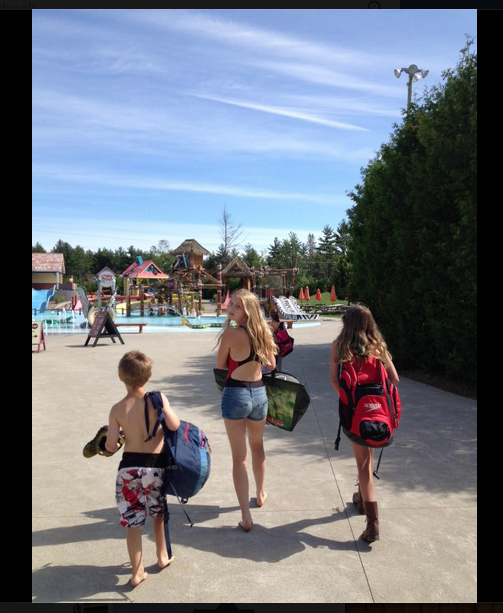 By the time the gates to the slides opened the kids were already running to be the first on the water slides. Check out the calendar on the Calypso site to plan your day of fun at the park. I am trying to “let it go” a bit more as a parent, meaning I’m trying to be less of a helicopter parent. KT brought her BFF with her to Calypso. The two girls spend the day running from slide to slide independently. They would come back to the Cabana to check in periodically or when they were hungry. 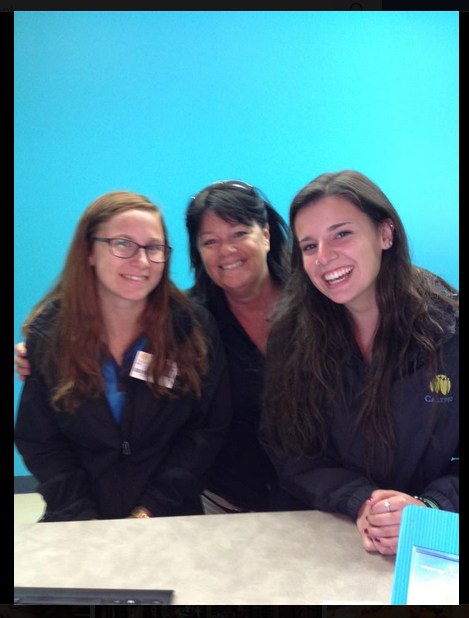 With close to 600 staff members, 120 lifeguards and 55 slide attendants I felt that KT and her friend would be safe and their well-being was a priority for the staff. Calypso also has a nurse on site at all times at the first aid station if medical attention was ever necessary. It was not easy to just let her go, but by showing KT I trust her and have confidence in her ability to take care of herself, I am helping shape the person she will become. Beckett, AndiePandie and I spent most of our time in the Jungle Run (lazy river) just outside our cabana and in the Pirate’s AquaPlay area. There were many primary aged participants on the pirate ship during our visit with older siblings and parents trailing along. One of the best parts of the magnificent ship is the huge bucket that completely soaks the participants with hundreds of liters of water. Zoo Lagoon is a preschoolers paradise. There are perfectly sized slides, water sprayers and splashy pools for the under 5 set. This area was filled with running toddlers and happy parents the day we visited. Just my speed, the Jungle Run. There are many options for lunches and snacks at Calypso, there is more than the regular park fare. We found the chicken Caesar salad to be the perfect side dish for the sandwiches and fruit tray we brought from home. You are able to bring in coolers of food and drinks to the park. However, there are no glass containers or alcohol allowed in the park for obvious safety reasons. Each bag and cooler is inspected upon entry so be ready to show what you have brought with you. Are we tall enough Mom? The five of us decided to complete the Jungle Challenge together. There are ropes of all sizes, abilities and strengths. We walked over alligators, logs, huge leaves and made our way across the obstacle course laughing at each. It was not an easy feat to cross the more challenging ropes course, I may need more time in the gym before I go again. Beckett relaxing with his Minions! 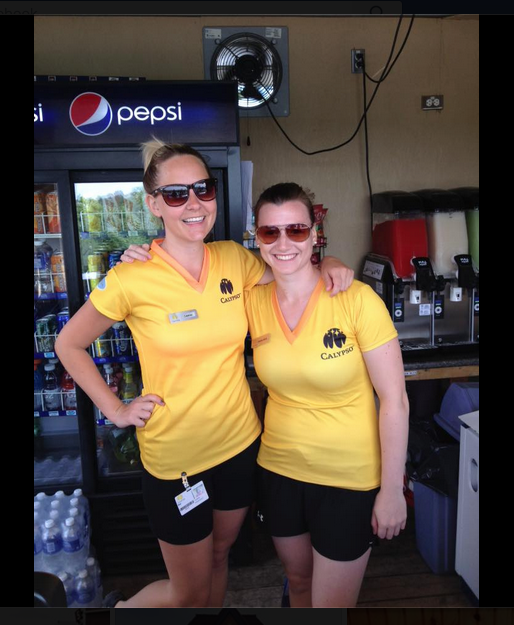 Safety is the number one concern for the staff at Calypso. If you are interested in learning more about the rides and how to ride them safely, I strongly suggest watching the videos on the website before you go. One final money saving tip, when you enter the park and pick up your tickets for the day, you will be asked if you would like a $10 return ticket. The return ticket can be used up to 6 days after your first visit. My family and I were compensated for our visit, however the opinions are our own. ← Canada Day Food Frenzy!